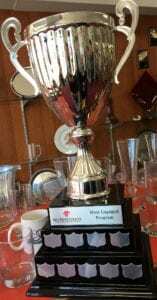 Last spring, the first ever, “Most Engaged Program” Cup and Plaque were awarded to Library and Information Technology and Apprenticeship Carpentry. (For more information about the cup and plaque, click here.) To get the new term off to a good start, the winners, as well as representatives from the honourable mentions, were invited to a pizza lunch. The program with the highest participation in the online Student Evaluation of Instruction/Course (SEI/C) will earn the most Engaged Program Cup. Systematic student feedback about their courses and instructors provides a critical feedback mechanism to help programs improve the experience for students. Indeed, for some programs this feedback is a required submission item to accreditors. Up until 2013, students in a fraction of all courses were asked to complete a paper based in-class instrument. The logistics of distributing the questionnaires as well as the processing costs, made expansion prohibitively expensive. In 2013, SAC approved a plan to replace the paper based approach with an in-class online process and the system was implemented by November 2014 for all courses which ended by December of that year. Based on the experience at other institutions, it had been assumed the student participation would be somewhat lower than the paper process but satisfactory enough to warrant the expansion. However, it quickly became apparent, that the response rate was well below expectations. A number of communications measures were implemented with limited success. It turned out we were not alone in having this challenge. In environmental scans of other institutions, one element stood out – participation increased if students perceived that their feedback was valued and would be acted on. 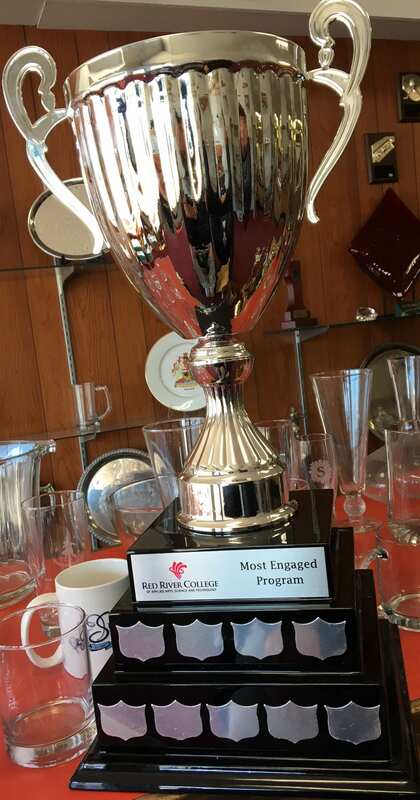 We want to build on this positive experience by establishing a trophy, “RRC Most Engaged Program Cup”, for the program with the highest online participation across all their courses. The winners will be able to display it for the year. The annual winner would be announced at Red Forum – a high profile acknowledgement in front of peers. All full-time programs with at least five courses in a year and that use the online course evaluation system will be eligible. Red River programs come in many shapes and sizes. The number of courses in a program varies as does the number of students in a course. To equalize across these factors, we took all them all into account to develop a combined rating. We will offer the program a framed photograph of the winning team as a permanent memento. For further information, please contact Ashley Blackman ablackman@rrc.ca. What is the purpose of the Student Evaluation of Instruction/Course (SEI/C)? The SEI/C is designed to help provide feedback to educators and ultimately improve the student experience. It will help us to continue building on our strengths. Why is the College evaluating all courses? The key thing going forward to ensure that the surveys provide valuable information to instructors and programs. By expanding the scope, there’s a better chance that we’ll have a more complete picture of what students think about the classes they’re taking. Why did the Student Evaluation of Instruction/Course change from the previous method? Previously SEI/C was done with a paper survey and only select instructors/courses were surveyed. As a result only a fraction of all courses could be done. This often meant the same instructors and courses were surveyed every year. Did you know that behind the scenes, outside of the busy class schedules, student contact time, and/ or regular workload, Red River College instructors and staff are continually pursuing higher education or conducting research to improve programs or processes? Others, like Research and Planning are conducting online surveys (Paths to Success and the Student Evaluation of Program) to help students in their programs to increase student success. RRC also partners with international centres like the EDUCAUSE Centre for Applied Research (ECAR) to find out the technology habits and needs of students. Whether it be creating English language benchmarks or interviewing youth about their personal experiences, all research studies being conducted at the College requiring the participation of staff or students must be submitted to the Research Ethics Board (REB) for ethical approval. A diverse number of research studies were reviewed by the REB in the 2012-13 Academic year. Here is a snapshot of the studies conducted by researchers at the College. The Pre-Primary Professional Development Intervention project is a joint initiative between the Aga Khan Foundation-Bangladesh and Red River College. The project is designed to support pre-primary teachers and supervisors, and increase the quality of pre-primary education in Bangladesh. This project asks the question “what do I need to know about you as a person to take the best care of you I can?” This question forms the basis on an intervention, which is designed to provide a simple, effective means by which health-care providers can come to understand the patient as a person, and facilitate the ‘delivery of dignity conserving’ care for palliative care patients and their families. Nurse Educators’ Experience of Graduate Education, Perceived Self-efficacy Beliefs and the Attraction to Academia. The purpose of this study is to describe the nurse educator’s lived experience of graduate education, their perceived beliefs of self-efficacy and their attraction to academia. The study seeks to gain a better understanding of what is needed to encourage nurses to complete graduate education and to engage in an educator role. 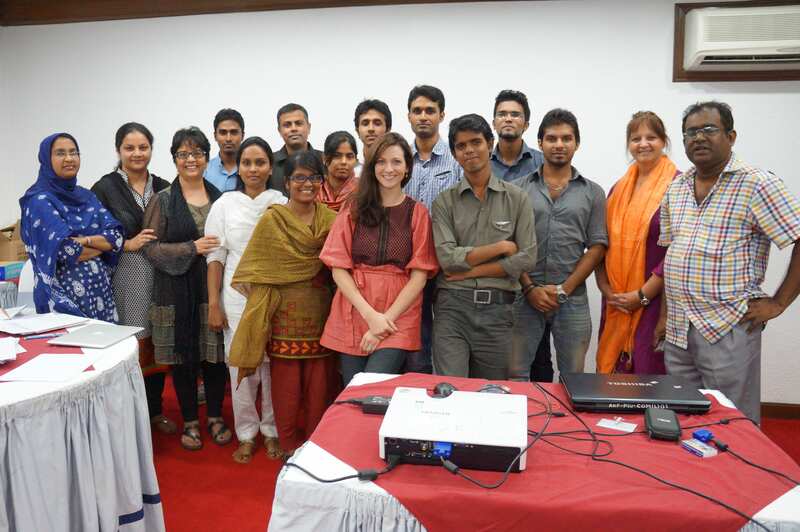 Back in January 2013, the Know Your Numbers blog was launched by the Research and Planning department to begin a journey in data storytelling. The blog is meant to help the College Community discover the data gems that would otherwise lay hidden in the survey archives, remain buried in the depths of Colleague, or be left stuck on a roll of brown paper curled up in a storage room corner. Our very first blog post was about the Academic Annual Report, a collaborative report that is chock full of data, charts, and more importantly some inspiring stories about this wonderful College and the accomplishments of people who work and study here. 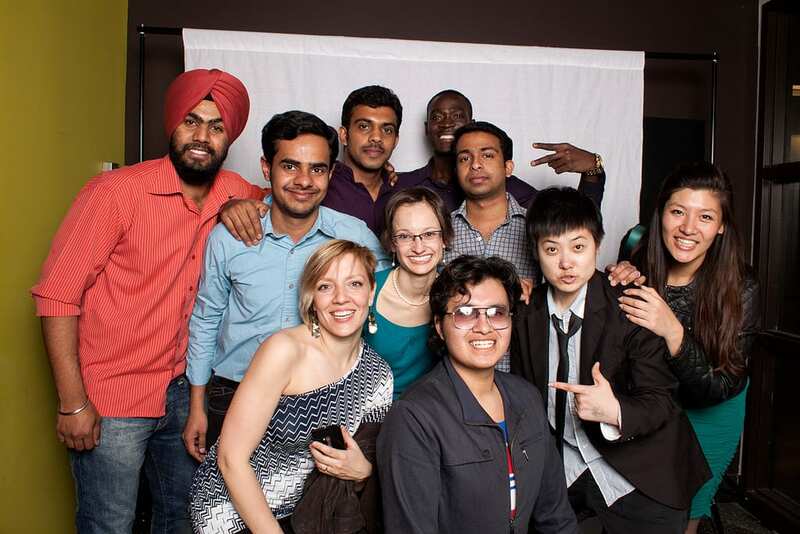 What do you know about first-year RRC International and Immigrant students? 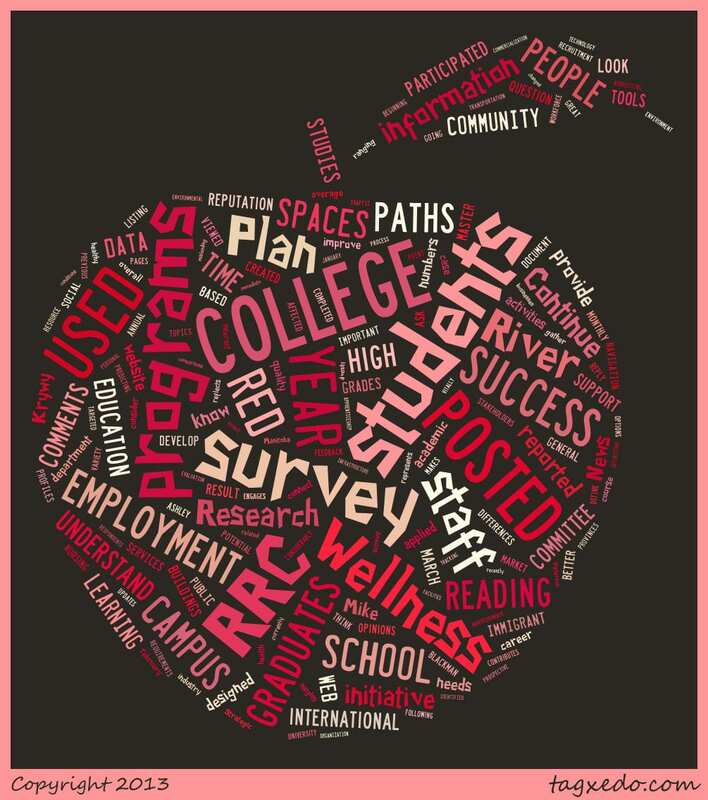 Every year, Red River College invites first-year, full-time students to participate in the Paths to Success initiative. Now in its eighth year, the initiative engages over 1,750 students each year from over 55 programs across the college. This post will look at some characteristics of International and Immigrant students who participated in the initiative during the 2012/13 academic year. These statistics are not “official” numbers as they are based on self-reported information from Paths and do not account for all students. 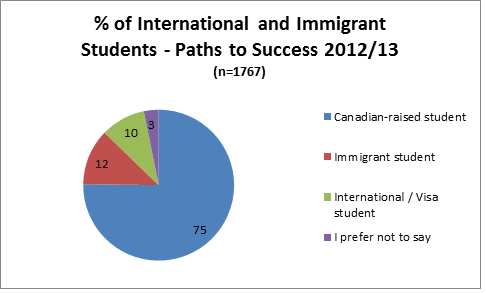 Among the 1,767 students who participated in Paths last year, just over one in five was an Immigrant student (12%) or an International / Visa student (10%). These numbers vary considerably by program, reflecting differences in the types of previous education and experience that those students have compared to Canadian born students. It also reflects the College’s policy to target marketing / recruitment of some programs toward International students and limit access to some programs to Manitoba residents only (such as the Nursing program and many pre-employment trades programs which have waiting lists). Many post-secondary institutions in both Canada and the United States rely heavily on high school students to fill their first year classes. In many provinces students go directly from high school to college or university upon graduation. As a result, educational researchers have relied heavily on the high school average or high school GPA as the critical measure for predicting the future success for a student, since it is the most commonly recorded indicator of previous academic achievement for most students. So why aren’t high school grades that helpful at RRC? Is there a relationship between high school grades and student success at RRC? The Research and Planning department has spent some time looking at whether high school grades can be used to predict success, following in the footsteps of many Canadian and U.S. researchers of post-secondary education. This includes combining high school course outcomes to create an overall average, as well as using self-reported grade 12 high school averages from the Paths to Success survey. The analysis below is based on self-reported Paths to Success data. 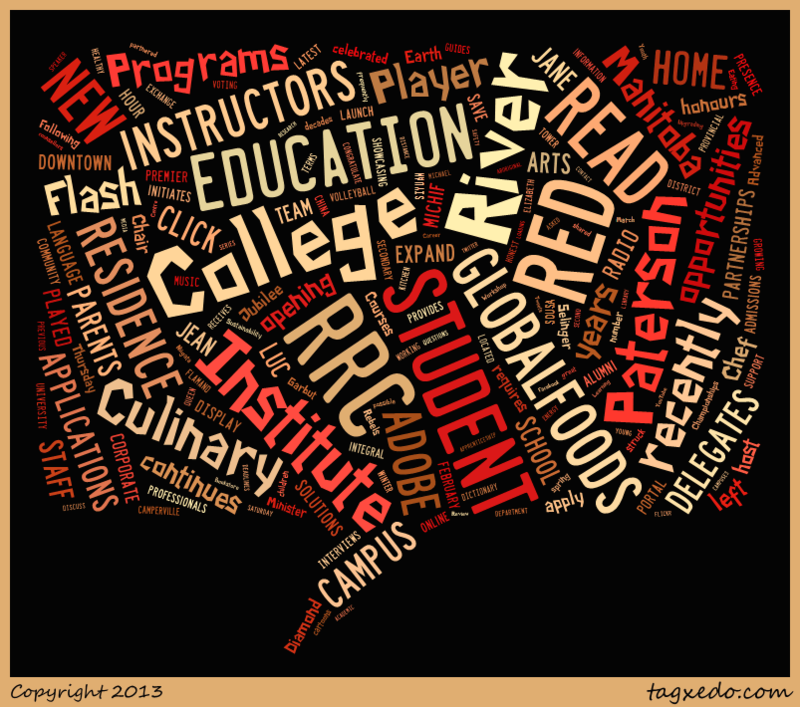 What do you know about first-year full-time RRC students? Most colleges and universities rely on student application data to develop student profiles, based on characteristics such as age, gender, and ethnicity. Some institutions use survey data to supplement this resource, as it provides a broader understanding of what students are like. Red River College falls into the latter group, using the Paths to Success survey to better understand who students are and how the college can more effectively support them in their studies. This post looks at some of the characteristics of students who participated in the Paths to Success initiative over the last 4 years. While the Paths to Success survey does not cover all first year students it represents approximately 80% of this population, and is considered to be representative of first-year students overall. Note: The Paths to Success initiative is targeted to first-year, full-time students who are just beginning their studies. Now in its eighth year, the initiative engages over 1,750 students each year from over 55 programs across the college. 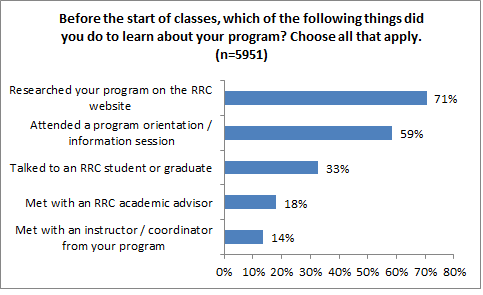 Just over 70% of students research their program on the RRC website before beginning their studies. Aside from program brochures, this is the only place where students can get detailed documented information on their program, including a program overview, course descriptions, contact information, admission requirements, and employment potential. Given that 30% don’t research their program on the web, it begs the question why they don’t use this resource. What’s the Grad Survey and why does it matter? The Graduate Satisfaction & Employment Survey is one of the tools used in Red River College’s quest to provide applied education that gets people into the workforce. The college contributes to Manitoba’s economy by graduating people who are ready to step into a career. Graduates of RRC’s programs have experienced many aspects of their chosen career from hands-on training, as well as the on-the-job work experience options available in many programs. There is considerable value in the effort that respondents put into a survey. People completing this survey are using their own time to give us their opinion, to help us understand what is working well and what isn’t. They are letting us know how their time at Red River College has affected their lives. Whether or not it was a perfect experience, a graduate can let us know through this survey. We show everyone what the graduates said in the annual Graduate Satisfaction & Employment Report. Who uses the survey information? Prospective students, high school and college counselors, academic advisors, faculty, employment agencies, and many others involved in career planning use the Graduate Satisfaction & Employment Report. This is the public view of the survey data that helps people learn about our programs and see how they connect to the labour market. The report includes tables and charts at a college-wide, school, and program level providing employment, satisfaction, and salary information. The Occupation chapter provides a listing of graduates’ job titles and related programs that is an easy-to-use tool for determining which program will lead a person to their desired career. 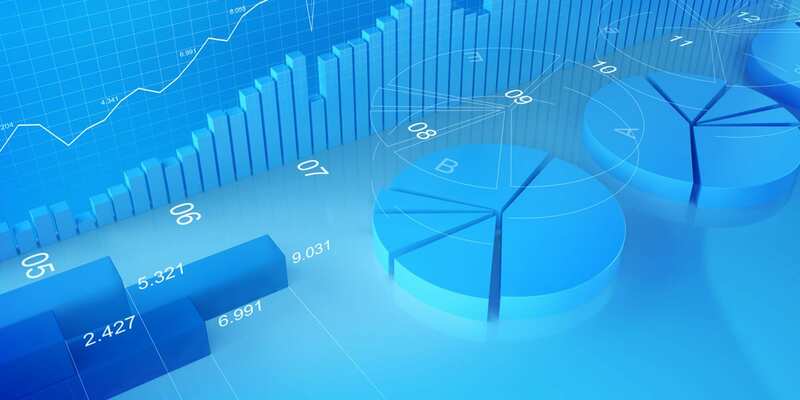 The data collected from this survey is also used in various formats by the College to improve programs and satisfy the Council on Post-Secondary Education (COPSE) reporting requirements. Red River College is the province’s largest post-secondary institution for diploma and certificate programs. In the 2011/12 academic year, the College had 9,135 students enrolled in full-time programs, 16,530 part-time registrations, and 3,408 apprenticeship students. Not surprisingly, the college’s website generates a significant amount of web traffic on a daily basis from staff, students, prospective students, industry and employers and the general public. Looking at a snapshot of the last 3 months, the RRC website had almost 200,000 unique visitors viewing more than a million web pages. To help the college get a glimpse of what’s going on, Research and Planning uses tools like Google Analytics as well as other web analytic tools to help understand what pages people are looking at, how they discover the website, and how long they stay. While there are many ways that web analytics are used to understand the RRC website, one interesting case study has been using these tools to get a better understanding of the College’s blogs – particularly the Wellness blog. The Wellness blog was created in January 2012 to provide a collaborative communication hub for the Wellness Committee, other wellness stakeholders at the college, and for staff and students. Over the past fifteen months, the blog has featured 130 posts from twenty-five authors on topics ranging from recipes and recreational activities to meditation and mental health. Who is visiting the blog? What drives traffic to the blog? What posts are people reading?